Microsoft Hohm Review: Will this Energy Audit Software Help with a Home Energy Audit? Home Basics: This details the year the home was built, location of the home, square footage and other basic information about the way it is heated and cooled. Structure: This details information about the foundation of the home, the framing, and exterior finish. Doors and Windows: This does a count of all doors and windows, along with the types, insulation, and framing. Heating and Cooling:This does an overview of your heating and cooling systems, temperature settings, insulation, and asks whether or not fans are in use. Water Heating: This details information on your water heater, including whether or not it is energy efficient, its temperature settings, insulation, and year of installation. Appliances: This details the appliances in your home, such as the refrigerator, a deep freezer, computers, etc. Lighting: This does a count of all the light bulbs in your home, both standard and CF. Pools and Pumps: This information is valid for those who have well pumps, spas, or pools as part of their homes. What Does Microsoft Hohm Do For You? Microsoft Hohm creates a home energy audit profile for you. There is an option to connect to your local provider for electricity and gas, though it was unable to find mine when I tested it. It will show you an approximate breakdown of where your energy spending goes, and offers advice on changes to make to help you save money on your energy costs each year. The suggestions from Microsoft Hohm come with a cost breakdown as well as an estimate of when it will pay for itself. For example, my home was built in 1931 and has an oil furance heating system which was installed before 1970. Microsoft Hohm suggested to, "When replacing your oil furnace, choose an Energy Star-labeled model with an AFUE equal to 90 percent." The DIY cost was estimated to be $700 to $1200, and the professional cost was estimated to be $2000 to $10,000 and when making this upgrade I could save $129 per year in energy costs, along with 1,201 pounds of Co2. With these calculations, I could break even in 7 years and 4 months. The recommendation even gave me the names, addresses, and telephone numbers of local professionals in my area I could hire to make this energy saving changes for me. Other suggestions included changing the lightbulbs in my home (most of them are CF) and turning off my computer when not in use (though I do that already, with Energy Star monitors, too.) These suggestions came with the same cost estimate and instructions for how to do it. Once your energy profile is complete, you can connect to your local provider and see your energy usage charts. You’ll also be able to see how your energy usage compares to others in your area. Is Microsoft Hohm Any Good? Honestly, I believe Microsoft has a good program here, because though there are other home energy audit software options out there, this one is free and easy to use. It was rather frustrating to complete the profile for this home because it’s a family home where my grandparents life and I don’t know all of the details. It’s been upgraded in a few places over the years, and I didn’t have all the details. For those who have extensive knowledge about the composition of their homes, it should be a cinch. I was disappointed with the fact that my local energy providers were not listed in the database, so I was unable to use that feature. The option to manually enter the energy data was available for those who experience issues with finding their local providers. Hopefully when the program comes out of beta, more companies will be available. 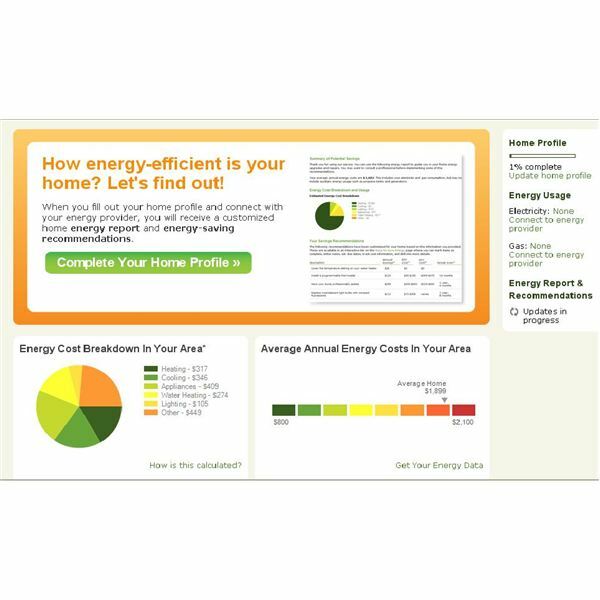 I do recommend this home energy audit software for anyone interested in finding ways they can reduce their energy costs and help the environment. Photo Credit: Lucinda Watrous. Screenshot of personal account taken 7/6/09.